The main difference between CPU and Core is that the CPU is an electronic circuit inside the computer that carries out instruction to perform arithmetic, logical, control and input/output operations while the core is an execution unit inside the CPU that receives and executes instructions. The CPU or the Central Processing Unit is the brain of the computer. It handles all the instructions required for the proper functioning of a computer. A CPU can contain single or multiple cores. A core is a unit inside the CPU that performs the actual execution. 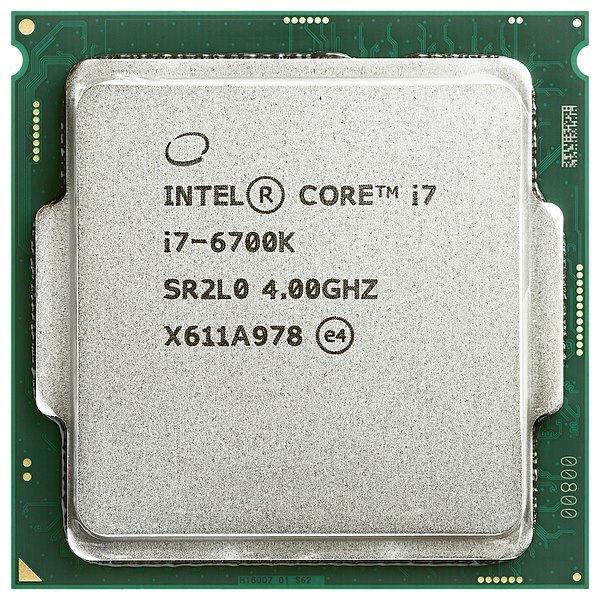 Most modern computers are multicore processors. They are capable of executing several instructions at the same time to increase performance. Furthermore, these systems are efficient and reduce power consumption. CPU is the brain of the computer. It ensures the functioning of all components in the computer. 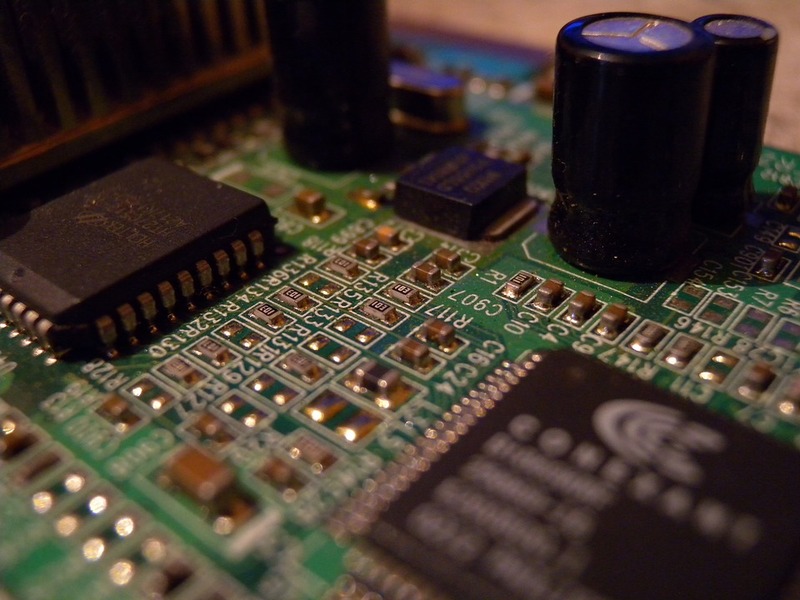 CPU consists of two subsystems: Arithmetic and Logic Unit (ALU) and Control Unit (CU). ALU handles all arithmetic and logical operations. It performs arithmetic operations such as addition, subtraction, multiplication, division, etc. The logical operations determine the logic of the statements, i.e., whether they are true or false, etc. Control Unit (CU) regulates and synchronizes the operations of the computer. Moreover, there are CPU registers to store fetched instructions and the results. CPU is also referred as the processor. The computer architecture helps to determine whether the CPU can process 32bit or 64bit instructions. The clock speed indicates the number of instructions the CPU can process within a second. The execution time for the CPU to execute a program can be calculated using the following formula. A core is an execution unit of a CPU. This unit is capable of reading and executing instructions. CPU or the processor can have a single core or multiple cores. When a system has more cores, it is called a multicore system. A CPU with two cores is called a dual-core processor. A CPU with four cores is called a quad-core processor. When there are multiple cores in a single CPU, it can receive many instructions and execute them on separate cores simultaneously. It increases the processing speed. Therefore, the number of cores in the CPU is a considerable factor in determining the performance of the CPU. It also implements parallel computing. The latest computers use multicore processors. It consists of single computing components with two or more processing units or cores to read and execute multiple instructions at a time. A CPU is an electronic circuit inside the computer that handles all instructions it receives from hardware and software running on the computer. A Core is the processing unit that receives instructions to carry on actions based on the instructions. CPU is a component inside the computer while core is located inside the CPU. A computer can have multiple CPUs or processors. A CPU can have single or multiple cores. 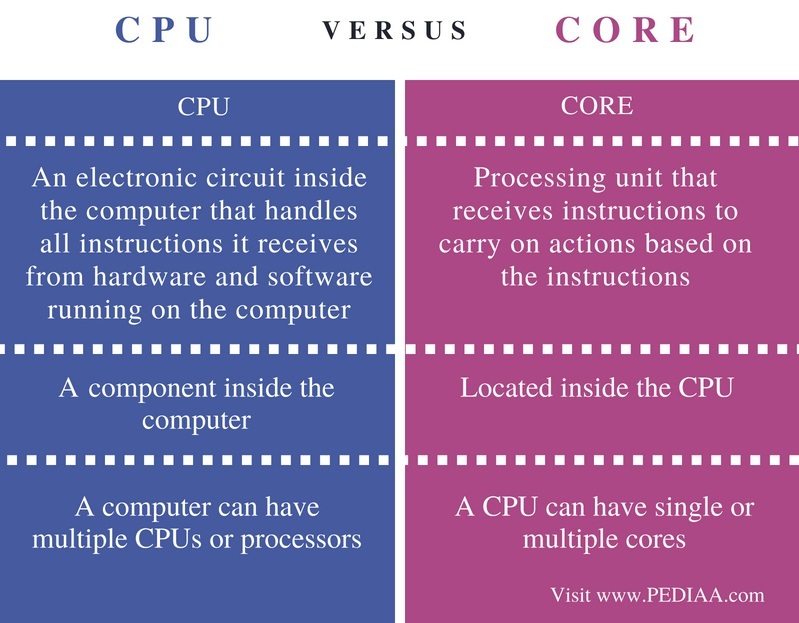 The difference between the CPU and Core is that the CPU is an electronic circuit inside the computer that carries out instruction to perform arithmetic, logical, control and input/output operations while the core refers to an execution unit inside the CPU that receives and executes instructions. 1. “Central Processing Unit.” Wikipedia, Wikimedia Foundation, 25 July 2018, Available here. 2. “What Is a Core?” Computer Hope, 21 May 2018, Available here.